Use one of these free toy box plans to build a gift for your child or grandchild that they'll cherish for years. It's a great way to add storage to a kid's room or playroom and the kids will love being able to organize all their toys. Some of these plans make it super easy to build a toy chest, but others may be more difficult if you're a beginner builder. Be sure to look through each plan to see which one will work best for your skill level and the child's needs. Each free toybox plan includes instructions, diagrams, photos, materials, tools, and even videos. All the plans are straightforward and easy to follow. 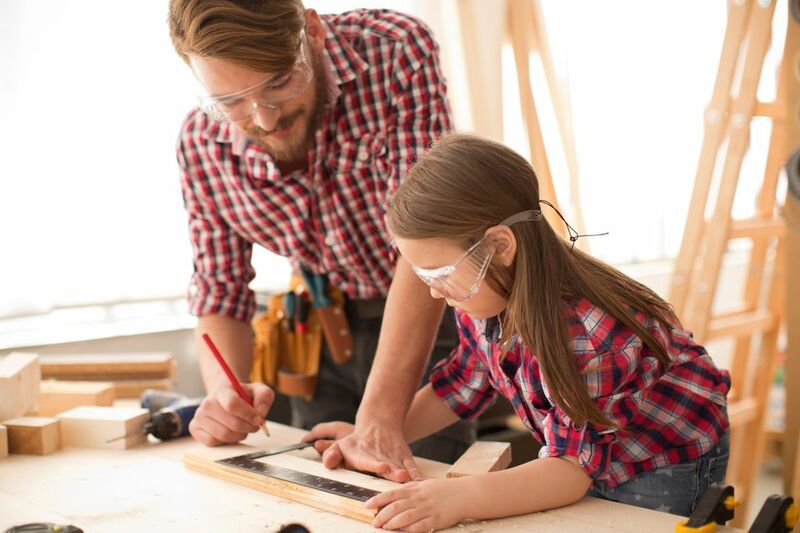 If you like these free woodworking plans, be sure to check out lots of other free ones, such as free plans for a playhouse, swing set, tree house, wine rack, kitchen island, porch swing, chicken coop, bookcase, picnic table, and coffee table. 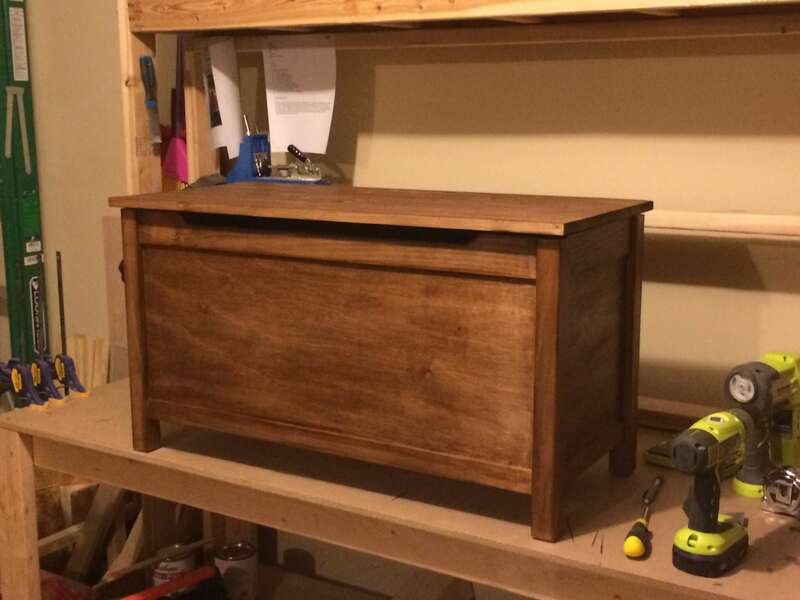 This is a simple toy box plan from Ana White that includes a hinged lid. This classic design was inspired by a ​Land of Nod bunk bed and it would look great in any child's bedroom. Older kids need a little more organization than just a big toy box and this toy storage plan will get them 9 different compartments to stash their stuff. This toy storage chest from Shanty 2 Chic holds Ikea's $4 Trofast baskets or any other similar sized bin. This makes it really easy for kids to take them in and out so they can only get out the toys they want to play with at the time. A supply list, color photos, written instructions, and diagrams will help you build this toy box in no time. This plan can be used as a toy box for kids or as a storage chest for someone of any age. The instructions and images are contained in a PDF file ​and are so detailed at each step that it shouldn't at all be a problem to build. A list of all the tools, supplies, and lumber that you need are listed off to the side, as well as a comprehensive list and measurements of all the different parts that make up this toy box. Safety hinges are used to ensure the lid stays open and doesn't slam shut when it's being used. Here's another toy storage plan that's perfect for older kids. A shelf sits on top of three divided bins and then two pull-out crates on the bottom. As part of the free plans, you'll get how-to instructions, a tools list, a materials list, a parts/cut list, and extra tips and tricks. Simple Storage Box is an easy guide to building a toy box from Instructables. As you can see in the picture, this toy box plan accounts for handles on the sides as well as a lid. There are detailed pictures, instructions, videos, and a list of materials in this free toy box plan. Build Something has a free toy box plan that combines toy storage along with a bookcase. It's the perfect solution for keeping all those books and toys in the same place. Everything is included in this free plan including a set of step-by-step building instructions, a tools list, a materials list, and parts/cut list, and lots of color photos and diagrams. This open toy box plan is easy to follow and can be built by anyone. There’s a video walkthrough you can watch for a visual idea of how this toy box is made, but there’s also a PDF file you can download, which includes a shopping list, color-coded illustrations, and step-by-step instructions. More Like Home's free plan lays out very easy to follow, detailed instructions for building a cheap toy box that actually seats two small children. Images and measurements are given throughout the steps to make it really simple to build this toy box. Here's a free toy box plan that shouldn't take more than around 5 hours to complete. Plus, it includes wheels and handles to make it easy for kids to move around. The estimated cost and time to build the toy chest, as well as a shopping list, pictures, downloadable template, instructions, and list of tools needed are included in this plan. This decorative storage chest works well for a toy box, but its design also lets it be used as a bench. This is an easy plan for beginners, so it shouldn't take longer than one day to complete it. The details for Rona's chest-bench plan are in a PDF file. It includes all the tools and materials you'll need, along with cutting and assembly illustrations. It's measured at 60" x 20" x 21". Kids like toys and chalkboards, which is why this toy box plan combines them into one. The chalkboard paint is applied to both the backdrop of the toy box as well as the front panel, but you could always change up the plan to customize it. Ten steps through and you'll be done with this toy box, and there are images throughout each of them, some with detailed cutting instructions.